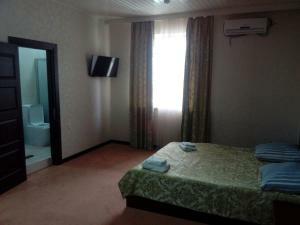 Qafqaz Gabala City Hotel features a lounge area, free WiFi and free parking. The rooms offer air conditioning, a minibar, TV and hairdryer. Guests can dine in the hotel's restaurant, and there is also a bar on site. Room service and breakfasts in the room are provided upon request. Yevkakh train Station is 91.2 km from Qafqaz Gabala City Hotel. 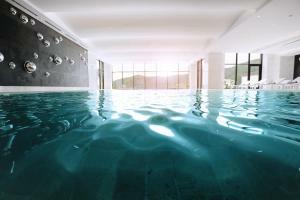 A spa centre, an outdoor pool, gym and bowling are offered at this 5-star hotel, set 5 km from Gabala Town. Free Wi-Fi and a 24-hour reception are featured at Qafqaz Resort Hotel. The elegant, air-conditioned rooms offer warm-coloured interiors and classic-style décor. Each room includes offers a flat-screen TV, a refrigerator and a private bathroom with free toiletries and a hairdryer. 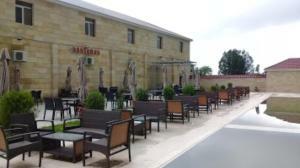 Qarabag Restaurant serves European cuisine, and Shirvan Bar offers a variety of drinks and snacks. Gabala Train Station is a 20-minute drive from Qafqaz Resort Hotel, and Gabala Airport is a 30-minute drive away. Featuring an indoor pool, a spa centre and gym, this 5-star hotel is located in Gabala town, 15 km from the ancient Qabala town. It also offers rooms with free Wi-Fi. Every air-conditioned room and cottage at Qafqaz Sport Hotel includes bright elegant décor with pastel tones and a minibar. A shower is provided in the bathrooms. Qafqaz Sport's restaurant, decorated in beige colours, serves international cuisine, and drinks are offered at the bar. Guests of Qafqaz can relax on the sun terrace by the outdoor swimming pool or in the sauna. A Turkish steam bath, as well as beauty treatments, are provided in the spa centre. Qebeland Entertainment Park is 5 minutes' drive from Qafqaz Sport Hotel, and Qabala Airport is 20 minutes' drive away. A shuttle service is available on request. Featuring a spa centre, an outdoor swimming pool and free Wi-Fi, this resort is located on the Damiraparan riverbank in Gabala town. It offers air-conditioned rooms and cottages with a DVD player. Every elegant room and cottage at Qafqaz Riverside Resort Hotel includes a flat-screen TV and minibar. Bathrooms are fitted with slippers and bathrobes. 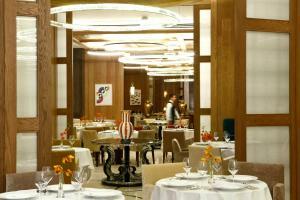 Azerbaijanian cuisine is served in Brasserie Restaurant, while cocktails are offered at Fireplace Bar and Vogue Cigar Bar. Fresh juices can be enjoyed at Vitamin Bar. Activities at Qafqaz Resort include billiards, table tennis and children's playground. Guests can also relax in the steam bath or on the sun terrace by the pool. Gabala town centre is 4 km from Qafqaz Riverside Resort Hotel, and Gabala Airport is 25 km away. Located in Nohurgishlag by the Nohur Lake, Chenot Palace Health Wellness Hotel is surrounded by tranquility of pinewoods, overlooking the peaceful Nohur Lake. Set in Caucasian forests, Chenot Palace offers unique programs tailored for specific needs of the body's well being. These combined treatment and diet plans aim to stimulate the body to eliminate toxins, deeper purification of the tissues, re-balance the physiological equilibrium, boost metabolism and restore body's vitality and energy levels with guidance of medical experts. The New Chenot Advanced Medical Diagnostics consists of state-of-art check-up technology that assess the current status of well-being in a holistic and systematic method, to measure specific needs of each guests. The hotel is ideal to gather strength and boost energy. The hotel has a Metabolic Laboratory for metabolic optimization, a Cryo Chamber at -110° C for whole-body cryotherapy and a Sports Lab for fitness screening, Antigravity technologies and Normobaric Hypoxic (oxygen reduced) training for physical wellness. Each room is designed to provide a calm atmosphere for your convenience. Rooms are equipped with air conditioning, a flat-screen TV and a private bathroom with a bath. Toiletries and bathrobes are fitted in each room. All rooms offer views of the lush gardens and the unique landscape. The hotel has a restaurant where you can enjoy selective and healthy dishes for your personal diet during your stay. You will also find an outdoor pool, terrace and a bar. Free WiFi and private parking are also available. All programs include medical and nutritional consultation to create the perfect treatment process for your needs and expectations. Detox programs offer detoxifying diet, bio-energic check-up, hyrdo-aromatherapy treatment, phyto-mud treatment and Chenot bio-energetic treatment. Weight loss and metabolic optimization programs focus on metabolic rate assessment, cardio respiratory assessment, body composition analysis and lipolytic advanced technology sessions. Recovery from stress and re-energising treatments are also offered with energetic massage, LED biophotomoudation treatment, hightone power treatment and more. At Chenot Palace a vast 26-hectare park provides a beautiful landscape that indulges in scenery of ponds, lakes and cascades of waterfalls. 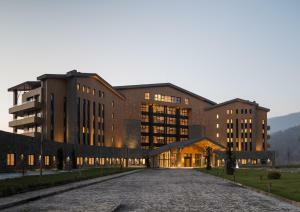 Gabala International Airport is 25 min driving from Chenot Palace Health Wellness Hotel. Located in Gabala, Elelef Park Hotel provides free WiFi. This 3-star hotel offers a garden. The accommodation offers a 24-hour front desk. At the hotel, every room is fitted with a wardrobe. 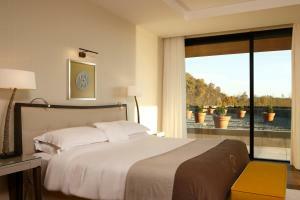 All rooms are fitted with a flat-screen TV, and certain rooms at Elelef Park Hotel have a mountain view. 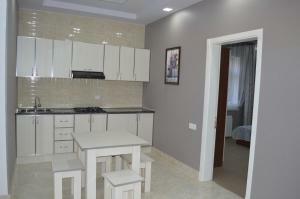 All units will provide guests with a fridge. A halal breakfast is served every morning at the property.